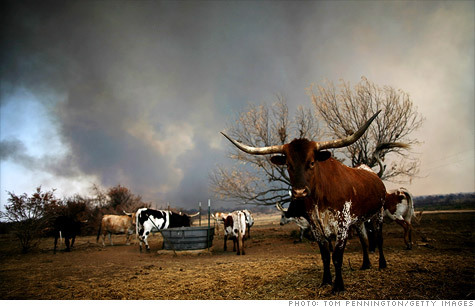 Scorched earth conditions have caused more than $5 billion worth of damage to Texas agriculture. NEW YORK (CNNMoney) -- The Texas wildfires are adding economic trauma to a state that has already suffered billions of dollars in agricultural damages from an ongoing drought. Wildfire damages to homeowners could exceed $100 million, a record high for the state, according to Mark Hanna, spokesman for the Insurance Council of Texas. "The fire losses for 2011 are already the worst on record in Texas," said Hanna in a press release. "These wildfires over the Labor Day weekend will only add to what has become a catastrophic year for Texas." This is above and beyond the economic damages of at least $5.2 billion from the drought, according to Travis Miller, professor in the soil and crop sciences department at Texas A&M University. He said the multibillion-dollar figure applies to year-to-date losses as of Aug. 15, and the true cost has "surely exceeded that by now." "Comments from bankers noted widespread negative impacts of the dry conditions -- low or nonexistent yields for many dryland crops, stress to irrigated crops and very poor pasture conditions," the bank said in its second-quarter survey of credit conditions. The Dallas Fed also noted that many ranchers are sending their cattle to the slaughterhouse earlier than they normally would, pressured by bone-dry pastureland. "Respondents in several regions mentioned that farmers will likely collect crop insurance money to offset drought losses," the bank said. "There were numerous reports of ranchers liquidating their cattle herds due to inadequate grazing conditions and a lack of surface water." Miller said farmers are slaughtering cattle so they don't have to keep feeding them, since the Texas hay harvest has been ravaged by the drought. "Ranchers are trying to sell their cattle because they don't have feed or hay," he said. "Feed prices are just ridiculous. We're trucking hay in from Missouri. It just doesn't make economic sense to keep feeding cattle at those prices." The wholesale slaughtering has helped to suppress the rise in beef prices, he said. Miller added that the drought wiped out nearly half the state's cotton crop, prompting the futures market to shoot up 25% in the last week. He said half the nation's cotton comes from Texas, but 3.4 million acres of this year's crop of 7.1 million acres "is going to be abandoned." More than 21,000 wildfires have burned through nearly 3.7 million acres in the Lone Star State, according to April Saginor, spokeswoman for the Texas Forest Service. She said fires consumed 1,915 homes, though firefighters were able to prevent the flames from claiming more than 30,000. Ten people have died in the fires, including four firefighters and six civilians, she said. While the East Coast is being swamped by heavy rains, the weather couldn't be different in Texas. The state is parched by a seemingly endless drought and an unusually hot summer, with more than a month of consecutive days exceeding 100 degrees Fahrenheit. This has reduced much of Texas to paper-dry scrubland, creating perfect conditions for scorched earth. The largest fire is in Bastrop County near the central Texas capital of Austin, consuming nearly 500 homes and 25,000 acres. It's truly the summer from hell for Texas.